Brentford defender Andreas Bjelland will miss the rest of the season after suffering a serious knee injury on his debut for the Championship club. 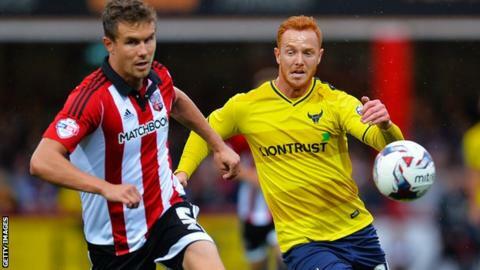 The 27-year-old requires surgery to repair "multi-ligament" damage he sustained in the defeat by Oxford. The centre-back joined the Bees for a fee of £2.1m from FC Twente last month. "The consensus is that such a procedure will take, on average, around nine months to recover from," said club medical chief Neil Greig. Denmark international Bjelland was forced off before half-time in Tuesday's Capital One Cup tie against the U's, which Brentford lost 4-0, after sustaining a hyperextension to his left knee. "Surgery will take place once the initial inflammation has settled," Greig told the club website. "His recovery will be well planned under the guidance of the leading knee consultant in the country. "Andreas's focus on recovery is already strong, which gives me absolute confidence that he will make a complete return to his previous level of football."